What’s that up there? Just a simple pork omellette. I was at two minds whether to post this ridiculously simple recipe over the net. I am sure this recipe is known by so many people and it bothers on embarrassment to put it up here. But then again, so are most of the recipes here, which are basically simple and common dishes cooked at homes. So, I thought maybe, just maybe, it might be something new to someone. 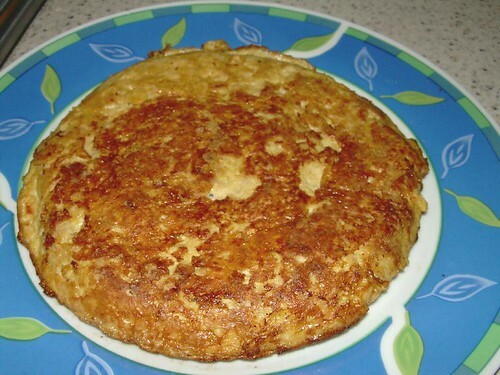 You should try to use a non-stick frying pan for this recipe and have real patience to cook it so that you can have a really nice piece of omellette which is firm to the bite, yet juicy. Combine garlic, minced pork and eggs in a bowl. Beat till mixture is even. Heat oil in frying pan. Pour mixture onto pan and gently stir mixture for about 15 seconds. Reduce to low heat and let omellette cook for 5 minutes or until upper layer almost dried up. Using a wooden / suitable plastic spatula, “loosen” the omellette from the bottom of the pan so that it can slide on the pan. Then, gently flip the omellette over and cook for another 2 minutes. Serve hot. However, it still tastes good even if it’s cold. You can actually flip the omelette over in the pan ! Wah…great chef at work! Thanks to 5xmom for “advertising” your blog. I totally like the recipes. They reminded me of my mom and grandma’s cooking. Oh, boy, I love omeletes!! !